If you are a small. local or solo business owner and wondering about the benefits of press releases for your business, then here are 7 ways press releases help you and your business. You can get national exposure by distributing press releases to the outlets of the national news media. Although the benefits of exposure for your business are obvious, you may be wondering how national media exposure can help your local, small or solo business. The answer is about positioning. Being recognized on high authority, third party national media websites is a great way to create improved status. Why? Because, most business owners have never done it. So, if you’re the one business owner, in your field with, national news media exposure, your status is dramatically improved in the eyes of your prospects, leads, clients, friends, family, peers and competitors. Authority Status allows you to quickly differentiate yourself from competitors in a way prospects can easily identify. Who would you prefer to be your chiropractor: the one with a medical degrees or the one with a medical degree who wrote the book on alternative back pain cures, does interviews, has a podcast and has been seen on ABC, CBS, NBC and others? You obviously stand out when compared to your competitors. Additionally, when you improve your status you’ll also gain influence in the marketplace. Would you like more money from higher conversions and raised prices? Again, its positioning. If you are news worthy, then you must be, at least, above average. While you build your authority, simply share your experience and where and when appropriate, display your credentials. This allows you to increase conversions on all of your marketing and sales material. As you gain more clients, raise your prices on your products and services. Wouldn’t it be nice to stop chasing prospects, leads and clients and have them chase you? That is what happens when you build your authority using press releases. Being perceived as “one of the best” causes your prospects, leads and clients to begin chasing you. They will chase you when you are in the news, positioned as an authority, advocate and educator; and getting more leads and clients. As a result of being an industry authority, the best clients – you know the ones: the ones with money that don’t complain and pester you all the time – want to work with you. And they respect and appreciate your time. Even if they are currently working with your competitors. 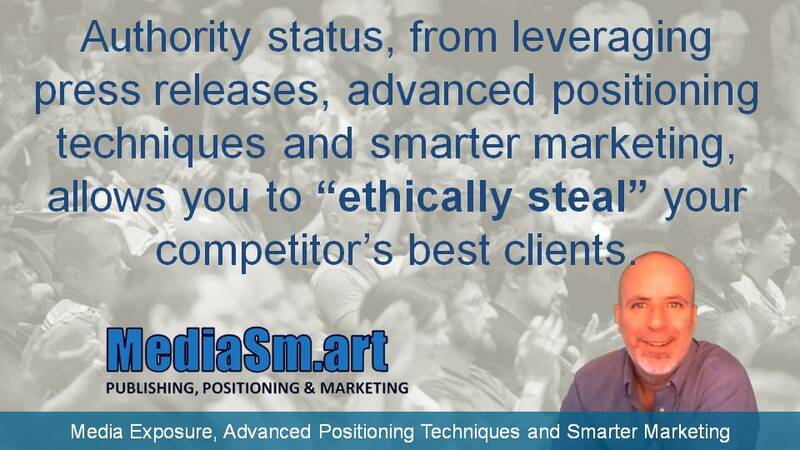 Authority status, from leveraging press releases, advanced positioning techniques and smarter marketing, allows you to “ethically steal” your competitor’s best clients. News releases generate tons of backlinks from high authority websites that boost your rankings. Use SEO best practices when writing your news releases and you’ll improve rankings and generate extra traffic. By the way, your visitors are the people who have read your press release and were interested enough to click a link to learn more about you. Nice, huh? This may be the best thing. There are few, if any, marketing strategies that are as effective as positioning for authority status as press releases. Positioning is business is like spotting the the ball on the one yard line in football; greatly increasing your chances for success. The best strategy, though, in my opinion, is to skip the DIY method. Sure, you could do it yourself, but you probably won’t because you are busy running your business. If you did do it yourself, it probably wouldn’t be as effective as if you hired a pro. An extremely worthwhile investment in yourself is to hire a pro. Professionals will get everything completed faster, correctly and more effectively. As you can see, best way to elevate to next level income and status is by building your authority credentials. Therefore, to get started implementing right away, visit MediaSm.art; or to learn more. MediaSm.art is my media and marketing boutique. We specialize in leveraging strategic publishing, advanced positioning techniques and smart marketing. We help small, local and solo business owners achieve next level income and status so you can enjoy the 7 ways press releases help you and your business, faster.